Sprinkles must have heard the news that it is Gluten Freeways' first birthday (or anniversary?) because the cupcake chain chose today to debut their new gluten free line! In the past Sprinkles has offered a gluten free cupcake during Passover without knowing it; indeed, the flourless chocolate cupcake the shop offered needed to be ordered without frosting and without the quintessential "dot," both of which contained gluten. For those reasons it was not advertised as gluten free. 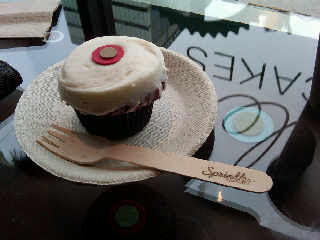 Luckily Sprinkles now stocks a full-fledged gluten free red velvet cupcake! What a way to celebrate the site's first birthday, right? I was very dubious when I first heard about the shop offering a gluten free cupcake. My doubts were put to rest by QuarryGirl and VeggyWood, two vegan bloggers in L.A. We tweeted back and forth and they filled me in that Sprinkles has both a gluten free and a vegan cupcake available! Hilary, my cupcake connoisseur friend, joined me as we went on an expedition to try these cupcakes. She also joined me on my first visit to Babycakes' Los Angeles outpost, so I knew she had it in her to enjoy the gluten free cupcakes just as much as I did. 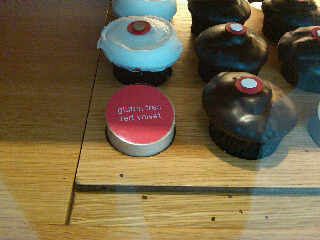 Of course, at Sprinkles, she wasn't limited to eating gluten free. The sign in the picture to the left reads: "gluten free red velvet." I've been waiting for those four words since I moved to Los Angeles back in August '08 and first learned about Sprinkles. New York has Magnolia, which I'd been dragged to visit with my gluten eating friends many times, and I soon learned that L.A. has Sprinkles. Clearly in this competition L.A. wins, as Magnolia has yet to create a gluten free cupcake. Of course it's simple to provide a gluten free option, or at least simpler than making it delicious. The true test came upon my first bite into the cupcake. Wow. This cupcake did not disappoint. Babycakes, you now have major competition. I wasn't pleased about eating it with that wooden fork you see in the above photo -- I think next time I'll take it home and eat it with a real fork. The wood was a terrible taste! But I digress; back to the cupcake. It was absolutely awe-inspiring. I can honestly say this is one of the top 3 gluten free cupcakes I have ever had, if not the best. The cake didn't crumble as many gluten free ones do, it was as moist as I remember regular cupcakes being, and the frosting... wow. That's really all I can say. The frosting really put it over the top. It was smooth, delicious, and truly amazing. I'm sorry that I can't provide a more articulate description of this cupcake, but I practically scarfed it down after that first bite. I will certainly be frequenting Sprinkles, particularly because they are so close to where I live! The cupcake also wasn't outrageously expensive; it was priced the same as Sprinkles' regular cupcakes! I'm used to paying a steep surcharge to eat a gluten free treat. It was a great surprise to learn that Sprinkles wouldn't be charging more. Of course some readers may gripe about the already over-inflated prices -- I believe my cupcake was $3.50. Not too bad for a fresh, gluten free cupcake. Obviously I'd prefer it to be cheaper... but what can ya do? Having never had a Sprinkles cupcake, I can't compare it to what a gluten filled one tastes like; however my friend Hilary, a regular gluten monster, said that she could barely tell the difference between my cupcake and hers. That's a high recommendation, particularly coming from her -- she's tasted plenty of gluten free treats with me. With Other Locations in Chicago, Houston, Dallas, Newport Beach, Phoenix-Scottsdale, and Palo Alto. Call me crazy, but why do you need to eat a cupcake with any kind of fork? Isn't the whole point of the cupcake that you can eat them with your hands?